Jack Marston is a Supporting Character in Red Dead Redemption 2. A boy too young to be running with outlaws, Jack was born into the gang and it’s been all he’s ever known. Child of John Marston, a big dog of the Van Der Linde Gang, and Abigail Roberts, a reformed prostitute who is also part of the gang, his parents have tried to shield him from the horrors of the outlaw life, but to no avail. While this is a concern for them, they can still take comfort in the thought that their son will be safe as all his aunties and uncles just so happen to be gunslinging badasses. Technically, this is his early life. 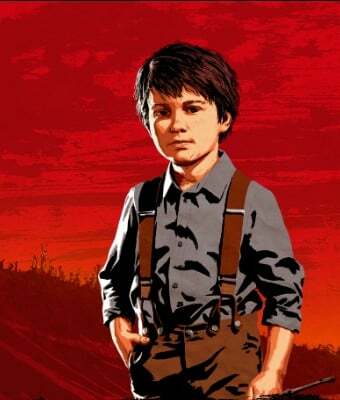 John “Jack” Marston Jr, was born in 1895 and is still very young during the events of RDR2. After his dad is injured and left for dead during a botched bank robbery in 06, Abigail and John use this as an opportunity to leave the group behind and settle down. Along with Uncle, they buy a plot of land in Beecher’s Hope and try to live a normal life. In 1911, Jack and Abigail are kidnapped by the government on the orders of Edgar Ross to strong-arm John Marston into hunting down his old Van Der Linde Gang associates. When John holds his end of the bargain they are let go and return to him and their ranch, but only temporarily as Edgar Ross eventually unleashes his cronies onto John’s farm. In a last ditch effort to save his family, John distracts the federal agents long enough for Jack and Abigail to get away. In 1914, after his mother passes and his buried next to his dad and uncle, Jack tracks down agent Edgar Ross and has a duel by a lake, in which he avenges his father and uncle.